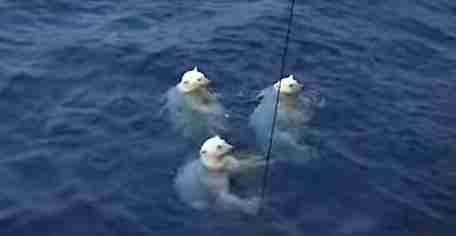 Researchers were out collecting samples from the Southern Beaufort Sea in Canada when three curious polar bears came swimming along. It wasn't totally clear what, exactly, drew the polar bears close - perhaps they were tired of swimming and were hoping to climb aboard, or perhaps they were looking for food. Or maybe it was simply a whimsical curiosity. Whatever it was, the scientists, who are studying the effects of climate change on the ocean, had to be firm with the animals they're ultimately trying to save. "Go away!" they shouted, nervous about possible damage to their expensive research equipment. But it's for the good of polar bears (and everyone else) that scientists are studying the potentially disastrous effects of climate change on the planet and our lives. As polar ice melts at unprecedented rates, polar bears are getting hungrier and hungrier because they are having a hard time finding food. Even though it's not unusual to see polar bears during these expeditions, scientists normally see them hunting on the sea ice, oceanographer Dr. Jay Cullen told Global News. 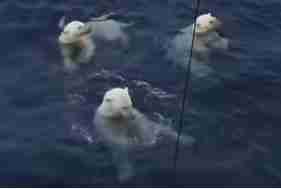 Finally the bears took the hint from the nervous scientists shooing them and began to swim away. 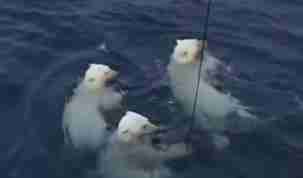 Even though the equipment was recovered undamaged and the bears were unharmed, one can't help but feel these hungry swimming polar bears are an image of things to come. "Of course the concern is that, as the sea ice melts, those swims get longer," Cullen said. Learn how you can help polar bears here.